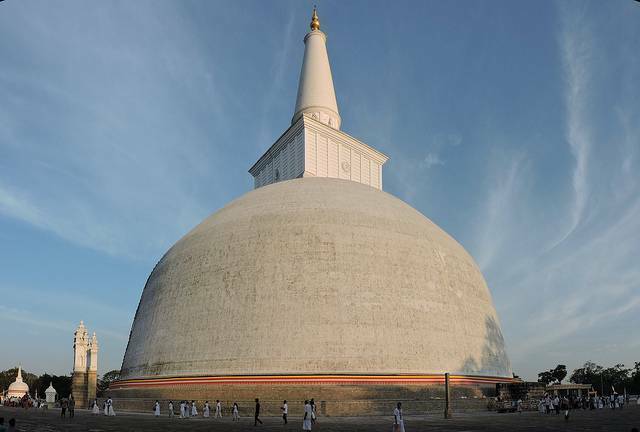 The ancient capital of Sri Lanka, Anuradhapura, is the seat of religion, traditions and cultures. Every piece of this land has some historical significance. The maximum number of Buddha’s relics are believed to have taken shelter in this island and most of these are in Anuradhapura. Ruwanwelisaya Dagoba, UNESCO designated site, is the most famed dagoba in this city that enshrines a begging bowl of Buddha. It is ranked second in the 8 holiest places of this city. The white bowl-shaped dome stands elegantly amidst green trees. To the west of this complex lays the oldest tank in the country, Basawakkulama, of 4th century BC. The Dagoba was originally 338 feet in height and 951 feet in its circumference and water- drop shaped, one of the largest and the tallest buildings in those times. However, the present reconstructed form shows a decrement in its height. King Dutugamunu commissioned the construction in the month of Visakha, on a day that coincides with many pious events in the history of Buddhism. The monument is protected by a base wall with hundreds of vibrant elephants painted on it. The whitewashed dome under the blue sky with a number of pillars and ponds form a picturesque setting.